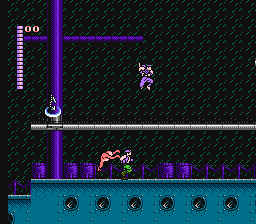 NES Shadow of the Ninja (Europe) in 09:22.13 by xipo. In the year 2029, evil Emperor Garuda somehow establishes a dictatorial government in the United States. After many lives are lost, two ninjas attempt to overthrow him. Blue Shadow is one of the rare games in which constantly jumping and slashing is faster than regular running. The author makes sure to use this move extensively both to travel and to deal damage to enemies, and so it may seem that the ninja has a severe case of ADHD. This game was released in the USA as Shadow of the Ninja. This is a 22.5 second improvement over the author's previous version. Note: this movie was played in NTSC mode, even though the game runs under PAL timing.